We recently attended the Simon Foundation “Innovating for Continence: The Engineering Challenge, 2013”. This was held in Chicago and was a mix of healthcare, industry and academic professionals discussing ways to help people with incontinence issues. Ramsey Coote under the guidance of Dr Esther Apos, see in photo, put together a poster on the interim results of our research project and analysed 150 records. This poster won first prize. 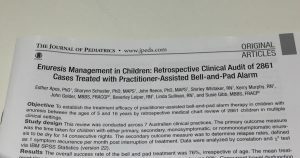 There were 40 posters in total and the results showed that the bell and pad system had an 87% success rate with an 11% relapse rate. The research will take an additional 12-18 months to complete and we plan to analyse approximately 3000 records which will provide evidence and education to help children become dry at night. We get many requests from practitioners and parents on the best approach to cleaning the bed-pads after each training program, so we have put a short video together to show how it is cleaned. During that time the bed-pad is in use as part of the training program wiping with a cloth nightly is necessary. After the training and when the child has become dry, we find that it is the scrubbing of the bed-pad that cleans it rather than just wiping it with a cloth. It is also important to keep the plug ends out of the solution you are washing it with. To clean it you can use detergent in water or a cleaner such as 2.8% Benzalkonium Chloride and mix as per instructions eg., 100mL to 5 litres of water. You also need to select a good quality nail brush as shown in the video. After the bed-pad has been cleaned and air dried it can be rolled up with the braid on the outside, wrap the cord around it and put back into its cover. You can also check this out on the Ramsey Coote Channel on You Tube. The new Royal Children’s Hospital in Melbourne has been open for a short while now so it was great to be able to see the new clinic where children are being helped to get dry at night. It is a huge improvement on the small office that was in the old hospital so we congratulate the team there on having a very functional and impressive facility that helps hundreds of children each year. The following photos were taken last week and show how the Ramsey Coote Alarms and bed-pads are stored and cleaned. The first photo shows the impressive cupboard space for storage. The second photo shows a chair that is used as a practice toilet and the final photo, shows the facilities used to clean and air dry the bed-pads. Check out our video Advertisment! It is the end of the financial year and we have been busy for the first half of the year with meetings in Brisbane, Sydney, Nambour and Las Vegas (National Kidney Foundation). It seems that wherever we go there are practitioners really interested in getting information about helping children become dry at night. You will notice a new name on our Links which is Dr Sue Bettison. Dr Sue has a new book on toilet training for children with autism or intellectual disabilities and this can be accessed at www.learn2do.net . Please check it out as it may help you develop your knowledge for helping these special children. Bedwetting is an issue that is not often spoken about in public so it was terrific to see the article in the June 15th Melbourne Herald Sun that gives parents information that they can get help for their children. See below if you wish to read the article. Ramsey Coote Instruments will be attending the American Academy of Pediatrics and will be at stand 1413 so please come and see us if you are there. If you are parent and not a practitioner then please contact us to find a practitioner that can provide help for your child to get dry at night. We had an amazing opportunity to share our tips in the Herald Sun, Click the link below to read more! It seems this year is progressing at a fast rate as we are now into the third month and this will another busy year for all of us. We are going to be attending the following meetings in the next few months and look forward to meeting with our customers. The first will be in Brisbane and is a Continence Education Forum on Thursday 17th and Friday 18th March, at the Brisbane Technology Park Conference Centre. If you are interested in attending gives us an email and we can send you the registration forms. The following week in NSW at Waterview in Homebush, is the Winds of Change Conference for the Council of Children’s Nurses Inc on 24th and 25th March. We mentioned in the December Newsletter that we will have some posters available targeting adolescents and these will be available for you to see at our trade display. Ramsey Coote Instruments will be attending the National Kidney Foundation Clinical Conference April 26-30 2011 in Las Vegas, USA. This is our first international conference that we will be attending the trade display so if you are going then please come and see us. We will have the Alarm and Bed-pad plus attachments to see how they operate and material to help you with running a bed wetting treatment service. Please come and see how to work with our products. If you are parent and not a practitioner then please contact us to find a practitioner that can provide help for your child to get dry at night.